Gund "Magical Light and Sound Unicorn" soft stuffed animal. Long, feathery rainbow mane and tail. Glittered, iridescent horn and light-up wings. Metallic harness and shooting star embroidery. Approx. 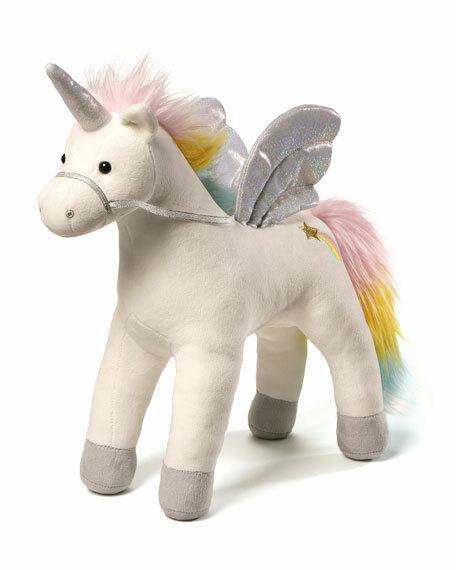 5"L x 17"H x 14"W.
My Magical Sound & Lights Unicorn, a magnificent animated plush, featuring light-up wings and sparkling sounds when you pet the back. A brilliant rainbow mane and tail with sparkly accents on the harness, horn, and wings complete the magical look. The oldest soft toy manufacturer in the U.S., Gund was founded by Adolph Gund in Norwalk, Connecticut, in 1898. Gund was one of the first companies to produce teddy bears, and today the company still creates unique soft toys that appeal to all ages. Classic Paddington Bear Soft Toy, 10"
Beloved Paddington classic bear, bright yellow Wellington boots, authentic "Please look after this bear" tag, red felt bush hat, wooden toggle buttons, felt blue duffle coat with yellow embroidered buttons on the cuffs. For ages 0 and up. 9"W x 3"D x 10"T. Polyester fibers. Imported. Ivy the hanging sloth plush toy, designed in New England by Douglas Cuddle Toys. Soft, floppy body makes Ivy extra lovable and cuddly. All Douglas products meet or exceed stringent safety tests. For ages 24 months and up. 16"W x 11"D x 16"T. Acrylic/nylon. Fill: polyester/plastic pellets. Imported. Douglas Sylvie Plush Sitting Sloth, 14"
Douglas "Sylvie the Sloth" in seated position. Realistic yet sweet sloth is extra big to sit perfectly on your hip.